A young child with a cochlear implant. Many children who are deaf or hard of hearing enter kindergarten and have difficulty communicating. When Lee Hartman’s son Charlie was born he couldn’t hear well. Since then Charlie has gotten medical help. But Hartman recognizes not every family has access to those resources. “Because of that their children face delays. They have problems with language acquisition. And they’re not ready for kindergarten,” said Hartman. Hartman was in Richmond Wednesday advocating for a bill making its way through the General Assembly. The proposal, patroned by Republican Delegate Brenda Pogge, would create a committee tasked with figuring out how children and families can get better access to early intervention. In the deaf community those different methods can be a point of division. 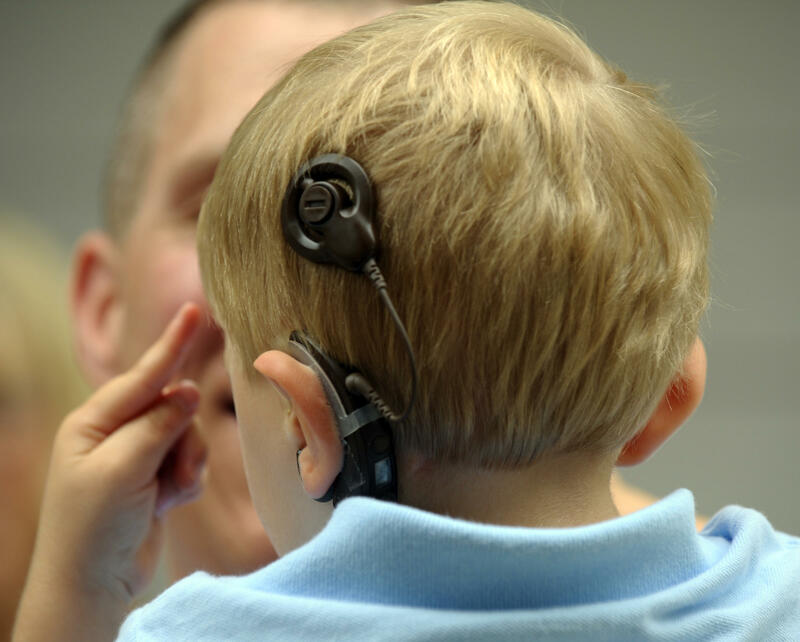 Some are more supportive of medical approaches, like cochlear implants. Others say a child doesn’t have to hear to communicate, they can use American Sign Language. Jenny Witteborg is with LEAD-K, an organization that advocates for Deaf children. Speaking through an ASL translator, Witteborg says the proposed committee relies too heavily on the input of doctors. Maureen Hollowell, whose adult daughter is deaf, agrees. She wants to know why the resources the state spends now aren’t working. “Not further debate, not further review, of the medical model of approaching deaf education or deaf communication,” said Hollowell. The proposed committee calls for 14 citizen members, including parents representing each education and medical choice. The committee would have two years to make recommendations to Virginia’s Disability Commission. The proposal does not include funding for further research and data collection. A separate bill that called for that data collection, but had a large fiscal impact, has already died in committee. *This article has been tweaked from an earlier version.